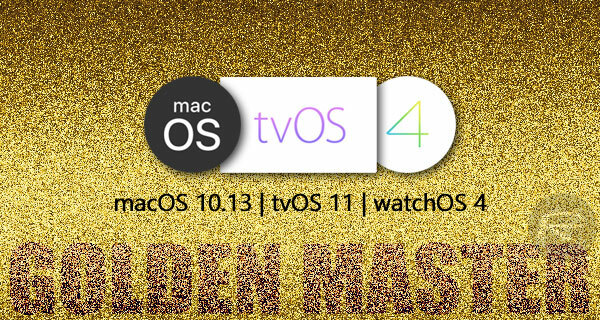 Apple has made available for download the GM (Golden Master) seeds of macOS 10.13 High Sierra, tvOS 11, and watchOS 4 with immediate effect. The release of the aforementioned firmware in their GM state essentially means that the Cupertino-based company is in a position where it’s comfortable and happy with progression ahead of a final release to the general public next week. macOS 10.13 High Sierra GM: If you take iOS 11 out of the equation, macOS 10.13 High Sierra is the platform to be excited about. Apple has really upped its game where the Mac is concerned making sweeping changes to a lot of native apps including bringing machine learning and advanced photo editing tools into the Photos app. There’s also a more efficient Mail experience, a dramatically improved Safari with new settings to prevent videos in websites from auto-playing, and even the switch across from HFS+ to the Apple File System (APFS), among many other things. If you are a developer registered on the Apple Developer Program portal, macOS 10.13 GM is available for you to download from either Mac App Store or developer.apple.com. tvOS 11 GM: With the introduction of the fifth-generation Apple TV, tvOS 11 becomes an entirely exciting beast. It may not get as much attention as macOS or iOS, but tvOS is definitely one of Apple’s growing platforms, both in capability and popularity. This latest version, which is now available as a GM download, offers new and improved functionality such as a new automatic light and dark mode which activates depending on when the hardware is being used, as well as new backgrounding and notification capabilities. The latter should allow third-party developers to push out new and dynamic apps to the tvOS App Store. tvOS 11 can be downloaded from either settings section of tvOS or directly from Apple over at developer.apple.com. watchOS 4 GM: watchOS has been progressing nicely over the last couple of years, and watchOS 4 adds perfectly to that progression. Apple has added some lovely little touches with this upgrade, including a set of new animated watch faces, and has also focused most of the engineering attention on reworking how workouts work and redesigning a number of the stock apps which facilitate those workouts. The result is a streamlined platform built purely for the small screen which is now available in GM. watchOS 4 GM for all Apple Watch models, including the just-announced Series 3, can be downloaded from Watch companion app on a connected iPhone or from developer.apple.com. As mentioned earlier, today’s GM seed of all of the above platforms are likely the very final build which Apple will roll out to everyone come Monday, September 19, except for macOS High Sierra final version of which will be available to download come September 25. There’s no High Sierra GM. Thanks for this info, I am looking everywhere but no info.